In addition to new serverside components, MapObjectsJava Edition now includes support for Mac OS X as well as projections and datum transformations. 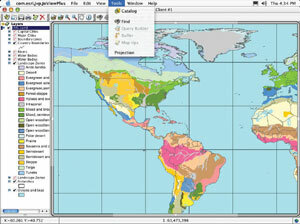 MapObjectsJava Edition 2 is the newest version of Esri's pure Java solution for the GIS Java developer. MapObjectsJava Edition developers can now benefit from having access to serverside components, allowing them to build map services, JavaServer Pages, and Java Servlets. Developers can also construct custom Enterprise JavaBeans (EJBs) and take advantage of industry-standard J2EE application server providers. MapObjectsJava Edition is ideal for integrating GIS and mapping functionality into an existing or planned architecture. For more information on MapObjectsJava Edition, visit www.esri.com/mapobjectsjava or call Esri at 1-800-447-9778. Outside the United States, contact your local Esri distributor.